This adorable 5 1/2" bear is called Thomas Rivers, he is part of our Apple Varieties collection and in style he is one of a new range of bears we have started making with their heads a different colour and length of fur than their bodies. Some of these combinations give great effect and Thomas Rivers, as you can see, looks like a lovely golden lion. He is made of deep gold Schulte mohair, soft and silky. His head is made of dark brown curly German mohair tipped in black and it looks great against the gold. His pads and paws are gold ultrasuede, he has a gold stitched nose and shiny black German glass eyes. We have filled Thomas Rivers with steel shot and steel balls so he is nice and heavy. I do hope you like him, he costs £40 plus postage. 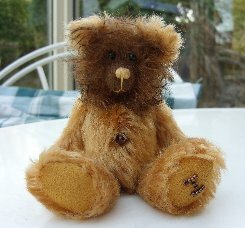 Please note that as with all our bears, Thomas Rivers is not a toy and is not suitable for children. Sorry - Thomas Rivers has been adopted.